Generation of T lymphocytes from induced pluripotent stem (iPS) cells gives an alternative approach of using embryonic stem cells for T cell-based immunotherapy. The method shows that by utilizing either in vitro or in vivo induction system, iPS cells are able to differentiate into both conventional and antigen-specific T lymphocytes. Lei, F., Haque, R., Xiong, X., Song, J. 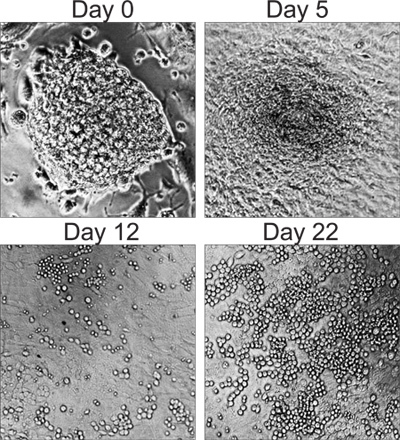 Directed Differentiation of Induced Pluripotent Stem Cells towards T Lymphocytes. J. Vis. Exp. (63), e3986, doi:10.3791/3986 (2012). Adoptive cell transfer (ACT) of antigen-specific CD8+ cytotoxic T lymphocytes (CTLs) is a promising treatment for a variety of malignancies 1. CTLs can recognize malignant cells by interacting tumor antigens with the T cell receptors (TCR), and release cytotoxins as well as cytokines to kill malignant cells. It is known that less-differentiated and central-memory-like (termed highly reactive) CTLs are the optimal population for ACT-based immunotherapy, because these CTLs have a high proliferative potential, are less prone to apoptosis than more differentiated cells and have a higher ability to respond to homeostatic cytokines 2-7. However, due to difficulties in obtaining a high number of such CTLs from patients, there is an urgent need to find a new approach to generate highly reactive Ag-specific CTLs for successful ACT-based therapies. TCR transduction of the self-renewable stem cells for immune reconstitution has a therapeutic potential for the treatment of diseases 8-10. However, the approach to obtain embryonic stem cells (ESCs) from patients is not feasible. Although the use of hematopoietic stem cells (HSCs) for therapeutic purposes has been widely applied in clinic 11-13, HSCs have reduced differentiation and proliferative capacities, and HSCs are difficult to expand in in vitro cell culture 14-16. Recent iPS cell technology and the development of an in vitro system for gene delivery are capable of generating iPS cells from patients without any surgical approach. In addition, like ESCs, iPS cells possess indefinite proliferative capacity in vitro, and have been shown to differentiate into hematopoietic cells. Thus, iPS cells have greater potential to be used in ACT-based immunotherapy compared to ESCs or HSCs. Here, we present methods for the generation of T lymphocytes from iPS cells in vitro, and in vivo programming of antigen-specific CTLs from iPS cells for promoting cancer immune surveillance. Stimulation in vitro with a Notch ligand drives T cell differentiation from iPS cells, and TCR gene transduction results in iPS cells differentiating into antigen-specific T cells in vivo, which prevents tumor growth. Thus, we demonstrate antigen-specific T cell differentiation from iPS cells. Our studies provide a potentially more efficient approach for generating antigen-specific CTLs for ACT-based therapies and facilitate the development of therapeutic strategies for diseases. Preparation of irradiated SNL76/7 (irSNL76/7) feeder cells for culture. SNL76/7 cells are generally maintained in 10% fetal bovine serum (FBS) Dulbecco's Modified Eagle Medium (DMEM) media. A culture dish or flask will be coated with 0.1% gelatin solution in 37 °C; incubator for 30 minutes before recovering SNL76/7 cells from liquid nitrogen. When SNL76/7 cells reach confluency, cells will be trypsinized off, centrifuged at 400 g for 5 min and resuspended in fresh media. Resuspended SNL76/7 cells will be irradiated in a 60Co irradiator with a dose of 5000 Rads. Alternative approach, SNL76/7 cells could be replaced by mouse embryonic fibroblasts (MEF) and mitomycin-inactivation could replace irradiation. After irradiation, cells will be centrifuged at 400 g for 5 min and resuspended in 10% dimethyl sulfoxide (DMSO) FBS freezing buffer, aliquot into cryovials and preserved in liquid nitrogen for future use. Preparation of OP9-DL1 cells for in vitro differentiation. OP9-DL1 cells will be generally maintained in 20% FBS α -minimum essential medium (α-MEM) media. When they reach to confluency cells will be split in a 1:5 dilution. Preparation of E.G7 thymoma cells. E.G7 thymoma cells will be generally maintained in 10% FBS Roswell Park Memorial Institute medium (RPMI)-1640 media. When they reach to confluency, cells will be split in a 1:10 dilution. General maintenance of iPS and TCR-transduced iPS cells. A culture dish will be coated with 0.1% gelatin solution in 37 °C for 30 minutes before seeding irSNL76/7 feeder cells one day ahead of recovery or split of iPS cells. For iPS cells split, the cells will be trypsinized off, centrifuged at 400 g for 5 min and resuspended in 15% FBS DMEM media. Trypsinized iPS cells will be incubated on a fresh culture dish for 30 minutes in 37 °C incubator before seeding on fresh irSNL76/7 feeder cell precoated dish to exclude differentiated cells and residue feeder cells. After incubation, 4×106 cells will be seeded in a 100mm culture dish. At Day 0, 5x104 iPS cells will be seeded on a 100mm culture dish containing confluent OP9-DL1 cell monolayer in 20% FBS α-MEM media. At Day 3, culture media will be changed with fresh ones. At Day 5, cells will be trypsinized off and centrifuged at 400 g for 5 min before incubating on a fresh 100mm culture dish for 30 minutes in 37 °C incubator. Floating cells will be collected and counted, 5x105 cells will be transferred to a fresh culture dish containing confluent OP9-DL1 cell monolayer in 20% FBS α-MEM media. Cytokine mFlt-3L (final concentration: 5 ng/mL) will be added in the culture. At Day 8, loosely attached cells will be gently pipette down. Wash the OP9-DL1 feeding layer with 10 mL PBS one more time to get the maximal recovery of partially differentiated iPS cells. After harvesting cells from the coculture, cells will be centrifuged at 400 g for 5 min and resuspended in 20% FBS α-MEM media supplemented with mFlt-3L (5 ng/mL) and mIL-7 (1 ng/mL). Cells will be transferred into a 6-well culture plate coated with confluent OP9-DL1 cells. Usually iPS cells recovered from one 100 mm culture dish will be transferred into one well of the 6-well plate. From day 10, culture media will be changed in every other day (20% FBS α-MEM media supplemented with mFlt-3L (5 ng/mL) and mIL-7 (1 ng/mL)). Culture plates coated with feeder OP9-DL1 cells will be changed in 4-6 days depending on the growth of the feeder cells. In vivo maturation of partially differentiated iPS cells. On Day 22 of coculture, iPS cells will be trypsinized off, centrifuged at 400 g for 5 min and incubated on a fresh culture dish in 37 °C for 30 minutes. Floating cells will be collected, passed through 70 μm nylon strainer to exclude cell clumps which might cause pulmonary embolism to mice and washed three times in cold PBS. Cells will be resuspended in PBS with a concentration of 1.5x107 cells/mL. Cells will be maintained on ice before injection. Before i.v. injection through the tail vein, mice will be placed under a infrared light to dilate their tail vein. After vein dilatation, 200 μl cell suspension or 3x106 cells will be adoptively transferred into a 4 week old B6.129S7-Rag1tm1Mom/J-mouse through its tail vein. Three weeks are allowed for in vivo maturation of partially differentiated iPS cells. Morphological changes of differentiated cells and cell recovery rates. Figure 1. At different days of coculture with OP9-DL1 cells, live cell pictures will be taken under conventional microscope. Cell recovery rates will be calculated based on the number of cells that harvested from culture. Flow cytometric analysis of surface marker changes. Figure 2a. At different days of coculture, cells will be removed from culture by trypsinization and washed with cold PBS before proceeding to cell surface staining. Before staining with different fluorochrome conjugated antibodies, cells will be blocked by Fc blocker 24G2 in 4 °C for 20 minutes. After 20 minutes staining in 4 °C, cells will be washed three times in cold PBS before flow cytometric examination. Activation of in vitro differentiated iPS cells. Figure 2b. One day before activation assay, precoat a 24-well plate with anti-CD3 (final concentration: 4 μg/mL, in PBS) at 4 °C over night. On day 22 of coculture, iPS cells derived T cells will be harvested from culture and washed with cold PBS before stimulating with plate-coated anti-CD3 and soluble anti-CD28 antibodies (final concentration: 4 μg/mL). Incubation will be carried out in 37 °C, 5% CO2 incubator for 40 hours and then Befeldin A will be added into culture for another 4 hours. At the end of coculture, cells will be harvested, washed and blocked by Fc blocker as described above. Blocked cells will be stained for surface markers as CD8 and TCR Vβ chain by using fluorochrome conjugated antibodies. After cell surface staining, cells will be fixed by using 4% formaldehyde and permeabilized by using Biolegend's Permeabilizing kit. After permeabilization, intracellular molecules like IL-2 and IFN-γ will be stained by using fluorochrome conjugated antibodies. Before final flow cytometric examination, cells will be washed three times in cold PBS to exclude excessive antibodies. After three weeks of in vivo development, Rag-/- mice will be sacrificed, spleen and lymph nodes will be removed from mice. Single cells will be processed through mechanical breakdown. Red blood cells will be lysed by using ACK lysis buffer and mononucleocytes will be collected and washed twice in cold PBS. After wash, cells will be blocked with Fc blocker 24G2 in 4 °C for 20 minutes and at the end of blocking, cells will be stained with different fluorochrome conjugated anti-CD3, anti-CD4, anti-CD8 and anti-TCRβ antibodies in 4 °C for 20 minutes. At the end of staining, cells will be washed three times in cold PBS before flow cytometric examination. MSCV-IRES-DsRED (MiDR) vector is constructed based on MSCV-IRES-GFP vector by substituting the GFP gene with the DsRED gene. OT-I T cell receptor gene is subcloned into the MiDR vector to make OT-I/MiDR construct. Retroviral transduction and cell sorting. Plat-E packaging cells are used to generate pseudovirus that will be used for following transduction. 3x106 Plat-E cells are seeded on a 100 mm culture dish one day prior to transfection. On day 0, Plat-E cells will be transfected with OT-I MiDR plasmid by using GeneJamma transfection reagent. On day 1, 1x106 iPS cells will be seeded into one well of a 0.1% gelatin precoated 24-well plate. On day 2, pseudovirus-containing supernatant from Plat-E culture will be collected and passed through a 0.4 μm filter to exclude potential contaminants. Transduction will be performed under the condition of 32 °C centrifuge at 1400 rpm for 1 hour in the presence of 5 μg/ml polybrene. After centrifuge-based transduction, cells will be placed in 32 °C, 5% CO2 incubator over night. On day 3, repeat the day 2 transduction procedure as described above. A 6-well plate will be precoated with irSNL76/7 feeder cells for future use. On day 4, transduced iPS cells will be trypsinized off, centrifuged at 400 g for 5 min and seeded on precoated irSNL76/7 feeder cells. At confluency, cells will be trypsinized off, centrifuged at 400 g for 5 min and processed for cell sorting. GFP and DsRED double positive cells will be sorted by MoFlo cell sorter. Sorted cells will be cultured on irSNL76/7 feeder cells for future use. Adoptive transfer and tumor challenge. OT-I TCR transduced iPS (OT-I/iPS) cells are generally maintained on irSNL76/7 feeder cells as described above. On the day of adoptive transfer, OT-I/iPS cells are trypsinized off, centrifuged at 400 g for 5 min and resuspended in fresh media. 30 minutes incubation on a fresh culture dish in 37 °C incubator is required to eliminate differentiated cell and remnant feeder cells. At the end of incubation, floating cells will be collected and centrifuged at 400 g for 5 min. Cell pellet will be washed in cold PBS for three times, and cells will be passed through a 70 μm nylon strainer in between of two washes to exclude cell clumps (2X filtration). After wash, cells will be counted and resuspended in cold PBS in a concentration of 1.5x107 cells/ml. For adoptive transfer, 4-6 weeks old female C57BL/6J mice will be used. Before i.v. injection through the tail vein, mice will be placed under an infrared light to dilate their tail veins. After vein dilatation, 200 μl cell suspension or 3x106 cells will be adoptively transferred through the tail vein. Six weeks will be allowed for in vivo maturation of OT-I TCR transduced iPS cells. After six weeks of i.v. injection, 4x106 E.G7 thymoma cells will be inoculated intraperitoneally. E.G7 thymoma cells will be harvested from culture and washed three times in PBS. At the end of wash, cells will be suspended in cold PBS in a concentration of 8x107 cells/ml. 50 μl cell suspension or 4x106 cells will be injected into the peritoneal cavity. In vitro characterization of OT-I TCR transduced iPS cells. Fluorescent microscopic examination of DsRED, GFP double positive cells will be performed under conventional fluorescent microscope with unfixed live cells. Gene integration and expression will be analyzed by both PCR and RT-PCR analyses. Cellular DNA or RNA will be isolated separately from samples by using Qiagen's DNA or RNA isolation kit. PCR and RT-PCR will be performed by using primers that specifically recognize the recombined VDJ region of TCR Vβ5 chain. T cell development and maturation. Figure 3a. At week 2, 4 and 6 post cell transfer, animal will be sacrificed and spleen, lymph nodes will be removed from animal. Single cell suspension will be made through mechanical breakdown. Red blood cells will be lysed by using ACK lysis buffer and mononucleocytes will be collected and washed twice in cold PBS. After wash, cells will be blocked with Fc blocker 24G2 in 4 °C for 20 minutes and at the end of blocking, cells will be aliquotted and stained with different fluorochrome conjugated antibodies in 4 °C for 20 minutes. At the end of staining, cells will be washed three times in cold PBS before loading on flow cytometer. On day 50 of tumor challenge, animals will be sacrificed and spleen, lymph nodes will be removed from animals. CD8+ T cells will be isolated by using Miltenyi Biotec's CD8+ T cell isolation kit. Isolated CD8+ T cells will be mixed with irradiated splenocytes isolated from naïve C57BL/6J mice in the ratio of 1:10 and pulsed with 0.5 μmol/ml OVA257-264 peptide for 40 hours. Thereafter, Brefeldin A will be added into the culture for another 4 hours. At the end of coculture, cells will be harvested, washed and blocked by Fc blocker as described above. Blocked cells will be stained for surface markers as CD8 and TCR Vβ5 chain by using fluorochrome conjugated antibodies. After cell surface staining, cells will be fixed by using 4% formaldehyde and permeabilized by using cell permeabilization kit. In vivo killing assay. Figure 3C. Splenocytes from naïve C57BL/6J mice will be isolated and labeled with carboxyfluorescein succinimidyl ester (CFSE) as target cells. Cells labeled with 5 μmol/ml CFSE (CFSEhi cells) will be pulsed with 10 μg/ml OVA257-264 peptide and cells labeled with 0.5 μmol/ml CFSE (CFSElo cells) will not be pulsed. A mixture of 2.5x106 CFSEhi cells plus 2.5x106 CFSElo cells will be adoptively transferred by i.v. injection into indicated recipient. After 16 hours, splenocytes from those mice will be isolated and CFSE+ cells will be analyzed by flow cytometry. Intraperitoneal tumor cell count. Figure 4. At day 20 of tumor challenge, mice will be sacrificed and peritoneal cavity lavage will be performed by using cold PBS. Peritoneal lavage recovered tumor cells will be counted. Tumor infiltrating T cells identification. Figure 5. At the late stage of tumor challenge, mice will be sacrificed and tumor will be removed from peritoneal cavity from different groups. Tumor will be cut into pieces; one piece will be put into a cryovial and placed on dry ice immediately, the other half will be fixed in formaldehyde and a third piece will be preserved in conditioned RPMI-1640 media for future use. H&E staining will be performed according to general protocol from formaldehyde fixed and paraffin wrapped samples. Immunofluorescent staining will be performed on cryopreserved samples. Tissue will be sectioned and preserved in -20 °C before use. Tissue sections will be air dried 15 minutes before 15 minutes cold acetone fixation. After fixation, the sections will be air dried for another 15 minutes before 5 minutes PBS wash.
After wash, place slides in a moist chamber and cover the tissue section with 30 μl 3% BSA in PBS for 30 minutes to block non-specific binding. At the end of blocking, blot off blocking buffer and cover tissue sections with a 50 μl mixture of PE-anti-TCR Vα2 antibodies and FITC-anti-OVA antibodies diluted in 3% BSA in PBS. Incubate in a moist chamber for 2 hours and at the end of incubation, slides will be washed three times in cold PBS and mounted with a water-based mounting media before fluorescent microscopic examination. Flow cytometric analysis of tumor infiltrating T cells. Tumor will be squashed into single cell suspension and red blood cells will be lysed by ACK lysis buffer. After washing and blocking, cells will be labeled with different fluorochrome conjugated antibodies that specifically recognize CD8, TCR Vα2 and TCR V β5 molecules that expressed on cell surface. After tumor challenge, mouse survival will be carefully monitored. CD3 and TCRβ are used as markers of T cells. To determine whether stimulation of iPS cells with the Notch ligand DL1 could contribute to T cell differentiation, we assessed expression of CD3 and TCRβ+ on iPS cell-derived cells, and further analyzed expression of CD4 and CD8, gating on CD3+ and TCRβ+ population. As shown here, on day 22, CD3+ TCRβ+ CD4- CD8+ single positive (SP) T cells were generated from iPS cells in vitro. In addition, the iPS cell-derived SP cells were able to produce IL-2 and IFN-γ when stimulated in vitro by plate-coated anti-CD3 and soluble anti-CD28 antibodies (Fig. 2), suggesting the iPS cell-derived T cells are functional. After adoptive transfer into recipient mice, the majority of TCR gene-transduced iPS cells underwent differentiation into CD8+ CTLs, which responded in vitro to peptide stimulation by secreting IL-2 and IFN-γ (Fig. 3). Most importantly, adoptive transfer of TCR-transduced iPS cells triggered infiltration of OVA-reactive CTLs into tumor tissues and protected animals from tumor challenge (Fig. 5-6). Thus, TCR gene-transduced iPS cells can differentiate into functional antigen-specific CTLs in vivo. Figure 1. Morphology of iPS cell differentiation. At various days, mouse iPS cells were co-cultured with OP9-DL1 cells in α-MEM medium supplemented with 20% FCS and 2.2 g/L sodium bicarbonate in the presence of 5 ng/ml mFlt3L and 1 ng/ml mIL-7. Figure 2. T cell differentiation from iPS cells. Mouse iPS cells were co-cultured with OP9-DL1 cells as described in Figure 1. On day 22, iPS cell-derived cells were isolated and analyzed. A) CD4+ CD8- or CD4- CD8+ cells after gating on CD3+ and TCRβ+ populations. B) Cells were stimulated with plate-coated anti-CD3 and soluble anti-CD28 antibodies for 5 hours at 37 °C at 5% CO2. 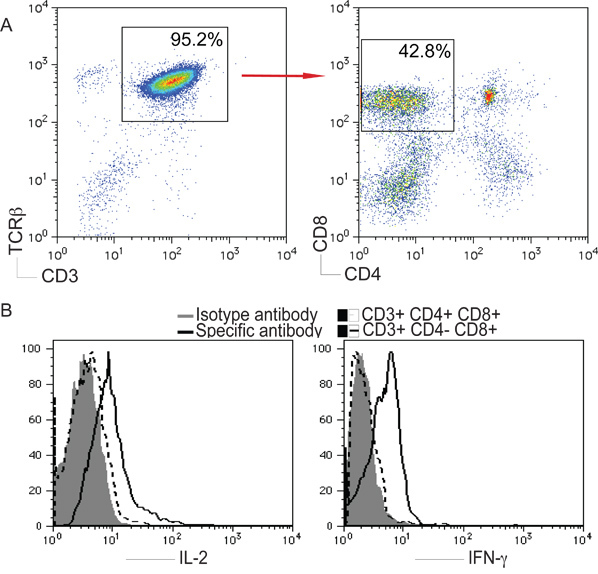 IL-2 and IFN-γ were analyzed by intracellular staining, after gating on live CD4- CD8+ T cells. Figure 3. Antigen-specific CD8+ T-cell development from iPS cells in vivo. OT-I TCR gene-transduced iPS cells were injected i.v. into C57BL/6 mice. After six to ten weeks, OVA-specific CD8+ Vβ5+ T cell development was determined. A) CD8+ Vβ5+ T cells from pooled LNs and spleen were analyzed by flow cytometry, after gating on CD8+ populations. B) IL-2 and IFN-γ production (dark lines; shaded areas indicate isotype controls) were determined by intracellular cytokine staining, after gating on the CD8+ Vβ5+ populations. C) In vivo proliferation/cytotoxicity assay. CFSEhi (right peaks) and CFSElo (left peaks) target cells were pulsed with OVA257-264 peptide and the control, respectively, and were injected into mice ten weeks after iPS cell transfer or one day after OT-I CTL transfer. Figure 4. 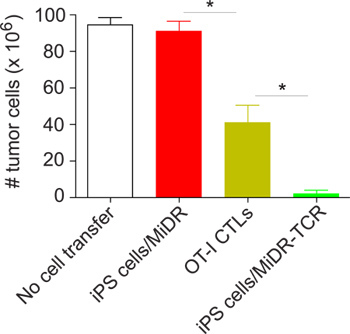 Adoptive transfer of OT-I TCR gene-transduced iPS cells suppresses tumor growth. OT-I TCR gene-transduced iPS cells were adoptively transferred into C57BL/6 mice. One group of mice was injected with OVA-reactive CD8+ T cells from OT-I TCR transgenic mice, and one group of mice had no cell transfer. After either six weeks or on the following day after the cell transfer, mice were subjected to challenge with E. G7 tumor cells. On day 20, tumor cells in the peritoneal cavity were enumerated. Figure 5. iPS cell-derived antigen-specific CTLs infiltrate into tumor tissues. On day 30 to 35 after tumor challenge, tumor tissues were examined for tumor-reactive T cell infiltration. A) H&E staining. Inflammatory cells infiltrated in tumor tissues (↓). B) Immunohistological staining. OVA-specific Vα2+ CTLs (red) infiltrated in OVA-expressing tumor tissues (green). C) Single-cell suspensions from tumor tissues were analyzed for expression of Vα2+ and Vβ5+ by flow cytometry, after gating on the CD8+ population. Figure 6. 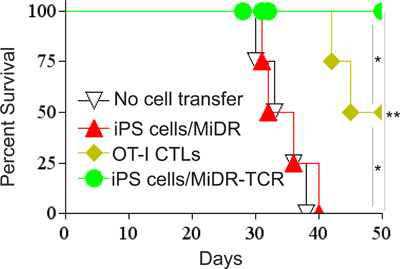 Adoptive transfer of OT-I TCR gene-transduced iPS cells sustains mouse survival. OVA TCR gene-transduced iPS cells were adoptively transferred into C57BL/6 mice that were subjected to challenge with E. G7 tumor cells as described in Fig. 4. Mouse survival on day 50 was shown by Kaplan-Meier survival curves (n=6). For ACT-based therapies, the in vitro generation of large numbers of highly reactive Ag-specific T cells for in vivo re-infusion is an optimal approach. Although our in vitro method gives rise of functional T cells from iPS cells, large numbers of iPS cell-derived cells die in four weeks, especially in the fourth week. We conclude that the survival signals from Notch signaling mediated by the DL1 as well as IL-7 and FLt3L are not sufficient to maintain the survival of iPS cell-derived progenitor T cells, other survival factors may be cooperative to regulate these cell maturation. 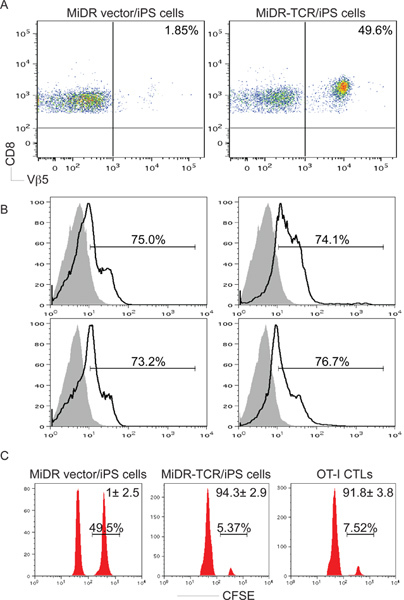 TCR gene transduction and in vitro stimulation with the Notch ligand largely direct T cell differentiation from iPS cells, however, the iPS cell-derived antigen-specific T cells still cannot survival longer, which prevents to obtain appropriate numbers of iPS cell-derived antigen-specific T cells for ACT-based immunotherapy. The development of T lymphocytes in the thymus is a well-ordered process. The immature thymocytes lacking expression of CD4 and CD8 are referred to as double negative (DN) cells. DN precursors are divided into developmental subsets based on expression of CD44 and CD25: DN1 (CD44+CD25-), DN2 (CD44+CD25+), DN3 (CD44-CD25+) and DN4 (CD44-CD25-). Only DN3 cells that have generated a functional TCRβ chain, which pairs with the invariant pre-Tα and the CD3 chains to form a pre-TCR and are selected for further differentiation. This event, termed β-selection, represents the first checkpoint during T cell development. Pre-TCR formation signals proliferation, termination of TCRβ locus rearrangement, and differentiation of DN thymocytes to the CD4+CD8+ double positive (DP) stage17. Our in vitro stimulation with the Notch ligand DL1 drives iPS cells to pass through the β-selection checkpoint in 2 weeks, and become pre-T cells (CD3+TCRβ+; CD25-CD44-; CD4-CD8-). Additional 2-week stimulation allows pre-T cells to transit into mature CD8+ T cells (CD3+TCRβ+; CD4-CD8+; CD62L+CCR7+ CD27+CD127+). The mature SP T cells will die in the absence of a further stimulation by the TCR and CD3 complex. In vivo programming of antigen-specific CTLs from iPS cells can overcome the deficiency to obtain sufficient numbers of T cells for ACT-based therapies. Despite the observed control of tumor growth, we identified some limitations of ACT with TCR gene-transduced iPS cells. First, at least six-weeks in vivo development is essential for T-cell differentiation derived from the transferred iPS cells. Second, we noticed fur loss, osteoporosis and other minor autoimmune manifestations in mice that received TCR-transduced iPS cells as observed in some clinical trials administrating T cell-based cancer immunotherapy. These effects may be caused by the generation of other immune cell types from the transferred iPS cells. However, how these cells are generated in vivo remains unknown. Third, adoptive transfer of TCR gene-transduced iPS cells has the risk of generating teratoma because of its stem phenotype. But so far in our study, we only identified extrathymic mass in one Rag1-/- mouse and have not observed abnormality in conventional C57BL/6 mice. Therefore, we suggest, to gain the maximal efficiency, it is better to get genetic background match for in vivo iPS differentiation. In contrast to derivatives of ESCs, abnormal gene expression in some cells differentiated from iPS cells have the potential to induce T-cell-dependent immune response in syngeneic recipients 18. Therefore, the immunogenicity of cells derived from patient-specific iPS cells should be evaluated before any clinical application of these autologous cells is contemplated. By analyzing the gene-expression profiles of iPS-cell-derived cells, it has been shown that a group of 9 genes (Hormad1, Zg16, Cyp3a11, Lce1f, Spt1, Lce3a, Chi3L4, Olr1, Retn) were expressed at abnormally high levels. In addition, inducing expression of three of these genes (Hormad1, Zg16 and Cyp3a11) in ES cells significantly increased immunogenicity on transplantation into genetically matched recipients 18. Thus, the group of 9 proteins has the potential to cause immune rejection of the iPS cell-derived cells after adoptive transfer, and may represent immunogenic markers. Nevertheless, the potential immunogenicity of iPS cell-derived T lymphocytes has not been determined. We thank Dr. Shinya Yamanaka (Kyoto University) for providing iPS-MEF-Ng-20D-17 cell line, Dr. Dario Vignali (St. Jude Children's Research Hospital) for supporting the OT1-2A•pMig II construct, Dr. Juan Carlos Zuniga-Pflucker (Department of Immunology, University of Toronto) for supporting the OP9-DL1 cell line, and Dr. Kent E Vrana (Department of Pharmacology, Penn State University College of Medicine) for helping the design of this study. This project is funded, under grants with the Grant Number K18CA151798 from the National Cancer Institute, the Barsumian Trust and the Melanoma Research Foundation (J. Song). Mouse restrainer Braintree Scientific, Inc.
Brenner, M. K., Heslop, H. E. Adoptive T cell therapy of cancer. Curr. Opin. Immunol. 22, 251-257 (2010). Hataye, J., Moon, J. J., Khoruts, A., Reilly, C., Jenkins, M. K. Naive and memory CD4+ T cell survival controlled by clonal abundance. Science. 312, 114-116 (2006). Seki, Y. IL-7/STAT5 cytokine signaling pathway is essential but insufficient for maintenance of naive CD4 T cell survival in peripheral lymphoid organs. J. Immunol. 178, 262-270 (2007). Stemberger, C. A single naive CD8+ T cell precursor can develop into diverse effector and memory subsets. Immunity. 27, 985-997 (2007). Siewert, C. Experience-driven development: effector/memory-like alphaE+Foxp3+ regulatory T cells originate from both naive T cells and naturally occurring naive-like regulatory T cells. J. Immunol. 180, 146-155 (2008). Wang, L. X., Plautz, G. E. Tumor-primed, in vitro-activated CD4+ effector T cells establish long-term memory without exogenous cytokine support or ongoing antigen exposure. J. Immunol. 184, 5612-5618 (2010). Hinrichs, C. S. Human effector CD8+ T cells derived from naive rather than memory subsets possess superior traits for adoptive immunotherapy. Blood. 117, 808-814 (2011). Alajez, N. M., Schmielau, J., Alter, M. D., Cascio, M., Finn, O. J. Therapeutic potential of a tumor-specific, MHC-unrestricted T-cell receptor expressed on effector cells of the innate and the adaptive immune system through bone marrow transduction and immune reconstitution. Blood. 105, 4583-4589 (2005). Yang, L., Baltimore, D. Long-term in vivo provision of antigen-specific T cell immunity by programming hematopoietic stem cells. Proc. Natl. Acad. Sci. U.S.A. 102, 4518-4523 (2005). Zhao, Y. Extrathymic generation of tumor-specific T cells from genetically engineered human hematopoietic stem cells via Notch signaling. Cancer Res. 67, 2425-2429 (2007). Boztug, K. Stem-cell gene therapy for the Wiskott-Aldrich syndrome. N. Engl. J. Med. Med, N. .E. ngl.J. . 363, 1918-1927 (2010). Peerani, R., Zandstra, P. W. Enabling stem cell therapies through synthetic stem cell-niche engineering. J. Clin. Invest. 120, 60-70 (2010). Mendez-Ferrer, S. Mesenchymal and haematopoietic stem cells form a unique bone marrow niche. Nature. 466, 829-834 (2010). Daley, G. Q. Towards the generation of patient-specific pluripotent stem cells for combined gene and cell therapy of hematologic disorders. Hematology Am. Soc. Hematol. Educ. Program. 17-22 (2007). Boitano, A. E. Aryl hydrocarbon receptor antagonists promote the expansion of human hematopoietic stem cells. Science. 329, 1345-1348 (2010). Himburg, H. A. Pleiotrophin regulates the expansion and regeneration of hematopoietic stem cells. Nat. Med. 16, 475-482 (2010). Tanigaki, K., Honjo, T. Regulation of lymphocyte development by Notch signaling. Nature immunology. 8, 451-456 (2007). Zhao, T., Zhang, Z. N., Rong, Z., Xu, Y. Immunogenicity of induced pluripotent stem cells. Nature. 474, 212-215 (2011). I enjoyed reading and watching your article. I would like to ask you if we can obtain OP9-DL1 from you.